After filing a federal lawsuit two weeks ago, Republican Congressman Bruce Poliquin is opening a second front in his challenge of the 2nd District election results. Poliquin has ordered a recount, and he insists that it is not about reversing the apparent victory of Democrat Jared Golden. Instead, he says it’s about making sure the results are accurate. But it may also be part of a larger GOP campaign targeting Maine’s landmark ranked-choice voting system. 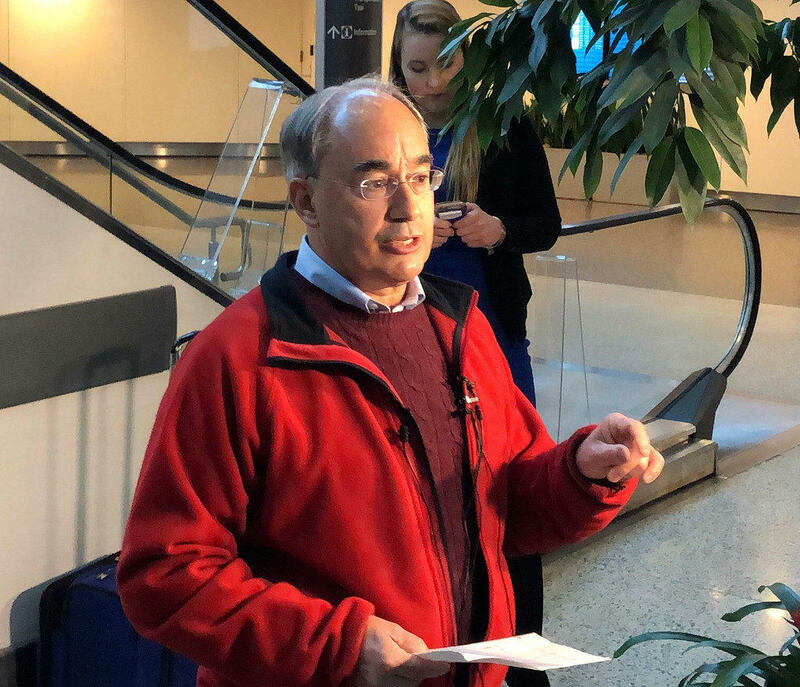 During his press conference at Portland International Jetport Tuesday, Poliquin attempted to frame both his legal challenge and recount request as anything but pursuits of self-interest. "This is not about who wins or who loses this election," he said. Instead, Poliquin insisted, it's about making sure Maine's ranked-choice voting law adheres to the U.S. Constitution, and that the nation's first runoff in a federal race under that system is legitimate. But since launching his legal challenges two weeks ago, Poliquin has used language that’s dismissive of ranked-choice voting, referring to it as “rank” choice voting, and describing the runoff process as chaotic and taking place in a mysterious black box. Poliquin went on to say that his campaign has fielded numerous complaints about ranked-choice: that some Poliquin supporters said they didn't know if they could pick just one candidate — him — or if they could rank him multiple times. Poliquin also says that he’s heard that election workers gave voters conflicting advice. "Well, I think if thousands of people are truly registering fear and confusion with Congressman Poliquin's office, I'd say they're going to the wrong office, because we're not hearing that," said Secretary of State Matt Dunlap, a Democrat. Dunlap said the majority of the questions fielded by his office have been about why ranked-choice voting wasn't used in gubernatorial and legislative contests and just in the congressional races. Dunlap also rejected Poliquin's assertion that a runoff process observed and scrutinized by the press and partisan attorneys over the course of a week was somehow opaque. He said it is true that the software used to conduct the runoff is proprietary, but that’s to assure election security. And he says granting access to that software in an age when foreign hackers are trying to infiltrate election systems would be a huge mistake. "Not keeping that secure is an absolutely laughable proposition," Dunlap said. Dunlap also noted that all of the election results from the 2nd District race are publicly available on the Secretary of State website. If someone wanted to replicate how the ranked-choice runoff worked, they could probably do it with a database program like Microsoft Excel. In fact, a researcher with the group FairVote, the group supporting ranked-choice voting, tweeted on Monday that he was able to do it. Still, Dunlap acknowledges that there was a mistake during the runoff. About a half-dozen towns incorrectly submitted tabulations that were not initially counted, but were later found when state election officials double-checked the results last week. Those several hundred votes increased the lead for Congressman-elect Jared Golden — and also provided another opportunity for Poliquin and the Maine Republican Party to question the integrity of the runoff. "Why did the Secretary of State's office find hundreds of new ballots yesterday, two weeks after this circus was supposed to be over?" Poliquin asked. Dunlap said the error was discovered because his office checked its work, and he said the additional votes didn't just go to Golden, but to Poliquin as well. Dunlap said that Poliquin has a legal right to request a recount, but believes it will be difficult to flip the results in his favor. "I'll tell ya, a 3,500-vote margin is pretty much like trying to swim across the Atlantic Ocean. It's a pretty wide gulf to bridge," he said. 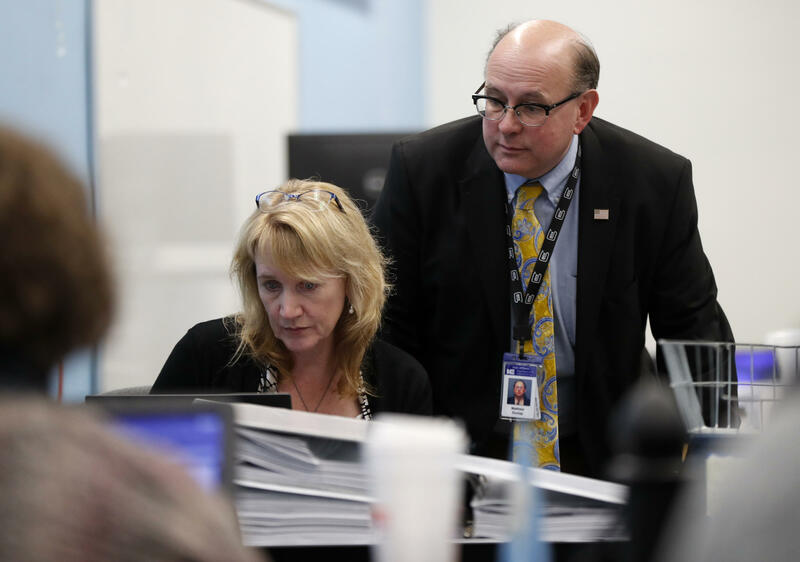 Maine Secretary of State Matthew Dunlap looks over the shoulder of Heidi Peckham as she goes through papers during the ballot-tabulation process for Maine's Second Congressional District's House election, Tuesday, Nov. 13, 2018, in Augusta, Maine. But prevailing in the recount — or in his legal challenge — may not be Poliquin’s only goal. Just as progressive activists embraced ranked-choice voting two years ago as a way of fixing Democrats' lackluster performances in elections with multiple candidates, Republicans are increasingly viewing the system as an existential threat to hardline conservative candidates. This partisan split is apparent in the polling. Two years ago, nearly 50 percent of Mainers supported ranked-choice while just 29 percent opposed, but a poll released during this year's election showed that opposition is growing among GOP voters at a time when Republicans have increased legal and rhetorical attacks on the system. Poliquin's apparent defeat has further mobilized conservative activists who recently circulated a petition designed to drum up opposition. During his press conference at the Portland Jetport, Poliquin was asked about his chances of prevailing in either the lawsuit or the recount. "This is about making sure that every Mainer that goes to the polls knows that he or she is casting his or her vote legally and making sure that vote is counted accurately," he says. Poliquin ignored several questions about whether it's also about ginning up opposition to ranked-choice voting.